Over at my Cookbook of the Day blog, we featured Nathalie Dupree's Shrimp and Grits. I thought of that book because last week I made "Scallops and Grits." Check out Dupree’s book and the original recipe for shrimp and grits. Then try these scallops and grits. In a skillet, fry the 2 strips of bacon till crispy, remove from pan and drain on a paper towel. Reserve about 2 tablespoons of the bacon grease. When cool, crumble the bacon. Add the grits to boiling water in a medium saucepan and stir continuously, about 5 minutes. Remove from heat, add salt and pepper to taste. Stir in 1/2 cup of cheese until incorporated into the grits. In the skillet with the bacon grease, add the crushed garlic and the scallions and sauté about 1 minute. Add the scallops and sauté about 2 minutes on one side, then turn and cook 2 minutes on the other side. Add the butter allowing it to melt. Place the grits in a bowl. 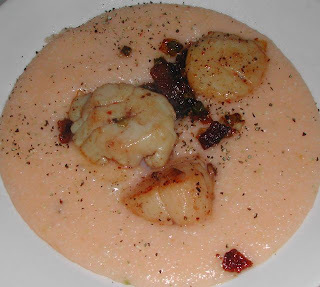 Spoon the scallops over the grits, and garnish with the crumbled bacon.